Welcome to the official website of the USS Brownson Association, the largest Destroyer association in the nation. 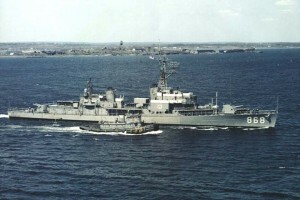 This site is dedicated to the memory of the USS Brownson (DD-868). It is designed to bring together past crew members of the Brownson and to give them a forum in which they can communicate with each other. If this is your first time here please take a moment to register for our mailing list. We’ll put you on our list so that you can keep track of what we’re up to and add your information to the roster so that others may find you. Note that registration has nothing to do with Association membership. It is for the website only. To join the Association, click on the Association button above and follow the links to the membership application. Looking for an old shipmate? Try the Roster. It contains a database of Association members and friends. We also have an extensive Memorabilia Gallery featuring photos and other materials contributed by members and others. Feel free to browse, there is no curfew here. The success of this site is up to you. If you have any materials which you would like to contribute to this site (photos, stories, or just ideas) contact us and let us know what you have.